We've had good response to our contest. 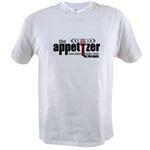 But only one week remains for you to enter to win a free Appetizer T-Shirt. Email D Grant (dgrantsmith@gmail.com) and provide where you listen from (city, state, and/or country) and some of the artists or songs you love from the Appetizer. Also please let him know some of the bands or songs you would like him to play in the future. One winner will be drawn at random and win. Good luck. Contest ends this coming weekend (8-28).